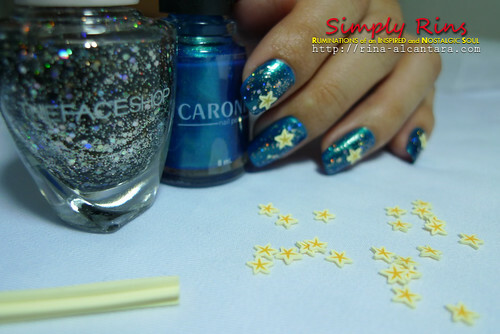 I asked my sister to name this nail art for me and she came up with "Starry, Starry, Night". I had no complaints. This would be my first time to use one of my fimo nail art sticks and I got excited. 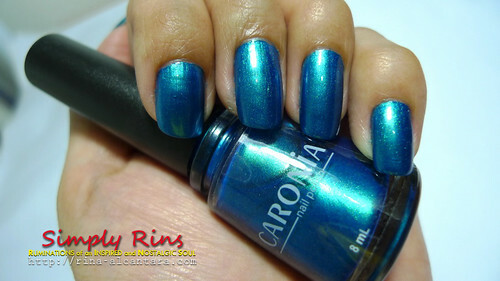 I've recently purchased a few colors from Caronia last weekend. I found some interesting colors I'd like to add to my nail polish stash. I used the Caronia Dare Frosted for today's nail art. This is 1 layer of base coat, 2 coats of Caronia Dare Frosted, and a layer of top coat. I'm loving the shimmer and the color. I can't actually tell whether it's blue? Is it aqua blue? But I like it anyway. 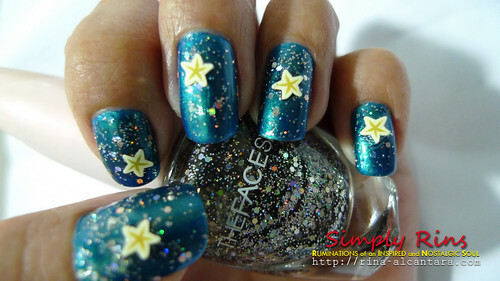 I added a layer of Faceshop Black Nail Pleasure (BK901) for sparkle and star fimo nail art. I was still getting used to cutting the fimo sticks into paper slices. Maybe in my succeeding attempts, my cuts would be more consistent and thinner. I can't wait to try the other Caronia colors! Yes, my nails are getting a bit long and I'm having a hard time drawing. I'll be cutting them very very soon!